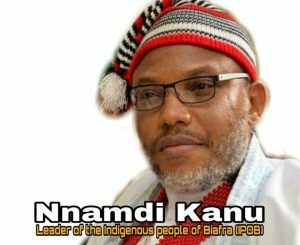 ABUJA – The Federal High Court, sitting in Abuja, has ordered for the immediate arrest of the leader of the Indigenous People of Biafra, IPOB, Nnamdi Kanu while revoking his bail over his continued absence in court since he was granted bail on April 25, 2017. Trial Justice Binta Nyako made the ruling Thursday, against the request of the defence counsel, after hearing an oral application from the prosecution counsel, Mr. Shuaibu Labaran who asked the court to revoke the powers of the provisions of Section 352(4) of the Administration of the Criminal Justice Act, ACJA, against the defence whom according to him, has been given enough time to produce the defendant in court. Labaran said, “My Lord, we humbly submit that the defendant has been given due and adequate opportunities in line with Section 352(4) of the ACJA 2015, and when he fails to utilize such opportunities, the court took the next necessary step of initiating the proceedings requiring the sureties to show cause; and even at that, this Honourable Court has been so magnanimous in granting several adjournments and giving the sureties the opportunity to show cause consequent upon which the court delivered the ruling on November 14, 2018, which is a subject of an appeal. “My Lord, I wish to state that parties are bound by the record of the court and any process filed in the course of the proceedings, falls back on the record of the court. It is therefore on record that even the sureties sought to withdraw their suretyship because they could not account the reason for absconding after being granted bail. In his reaction, Kanu’s counsel, Mr. Ifeanyi Ejiofor, vehemently objected the prayers of the prosecution on the grounds that the court has not given the defence an opportunity to come to court and explain why the IPOB leader has failed to attend proceedings. Giving her final ruling after hearing the submissions of both counsels, the presiding judge, Justice Nyako stated that the defence has been given enough time to produce Kanu in court but failed, hence her decision to revoke the bail granted to the defendant and issue warrant for his arrest and continuation of his trial in his absence. “This case was tried along with three others and was granted bail in this court on April 25, 2017, upon certain conditions. The case was adjourned to July 11, 12, 2017. That day, the case was supposed to come up but the court was on vacation. “It subsequently came up on October 17, 2017. The learned counsel of the defendant informed the court that the house of the defendant was invaded by the soldiers and they did not know the whereabouts of the defendant. “Counsel to the first surety told the court that the first surety said he did not know also the whereabouts of the 1st defendant and asked for time to produce him. “The court ordered that the sureties come to court and show cause why the defendant is not in court. The case came up again on February 20, 2018, for the sureties to show cause why the first defendant has still not appear before the court. “The three sureties then applied to be discharged from the suretyship because they did not know where the defendant, Nnamdi Kanu is. “Upon the application of the counsels of the defendants(before now), the trial of the first and only defendant in this case, Nnamdi Kanu, was separated from that of the others. The case of Mr. Nnamdi Kanu was adjourned to March 28, 2018, for the defendant to appear in court or the sureties. “Till date, there have been four adjournments. All these is for the defendant to appear before the court or for the sureties to either produce him or forfeit their bail bonds which is subsequently ordered on November 14, 2018. “I have taken time to direct the sequence of proceedings prior to this time, pursuant to the assertion of the ACJA to the 1st defendant (the only defendant) in this case. I’m of the opinion that the learned counsel is only seeking for time or trying to delay the case. “Once an action has been filed before the court, it must finish in one way or the other; either by the judgment, discharging, or convicting the defendant, or that the prosecution withdraws the charge(s) or the Attorney General withdraws the charge. In the instant time, the case must continue either way. “The above signifies that I have given counsel more than enough time to produce the defendant and continue with the trial, but they have not been able to do so. “By virtue of the provision of Section 352(4) of the ACJA, the only option before this court is to continue with the trial of the defendant in his absence. “Also, since I have not been given any cogent, concrete and convincing reason for the absence of the defendant, I hereby revoke his bail and order that a bench warrant be issued for his arrest,” the judge stated. The court thereafter, adjourned Kanu’s trial till June 18, 2019. Earlier during the opening of the day’s hearing, the court had ruled for “stay of proceedings” on the matter involving the sureties, pending the determination of an application filed at the Court of Appeal to relieve them from standing as sureties to the IPOB leader. Recall that Kanu, as the leader of IPOB, calling for the restoration of the sovereign state of Biafra, was forced to jump bail when he escaped from the country after the invasion of his hometown in Afara-Ukwu, Umuahia, Abia State by military personnel where more than 28 members of IPOB members and his relatives, including his pet dog, Jack, were massacred by armed soldiers in a military operation. He resurfaced on 19th of October, 2018 at the Western wall of Jerusalem, Israel where he was sighted on video praying at the Wailing Wall.